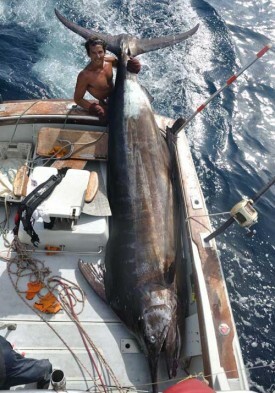 A somewhat disappointing May for big billfish around the world – the totals equaled the April number of large billfish caught, which is a bit of a surprise given that May usually produces its fair share of big fish. Unsurprisingly Hawaii tops the charts with seven 500+ blues in the month of May – typically this is one of the top months for the large girls. Madeira’s bite got an early start, the Canaries are starting a bit slowly, and South Florida saw a good number of large broadbills this month. But no doubt the highlight for May was the grander caught in the Ivory Coast (see granderwatch.com for more information). These reports are great! Keep them coming. Bill Billson is still on the Reef and fishes on the viking II. Very successful captain. You can check him out on our links on the right side of the page.